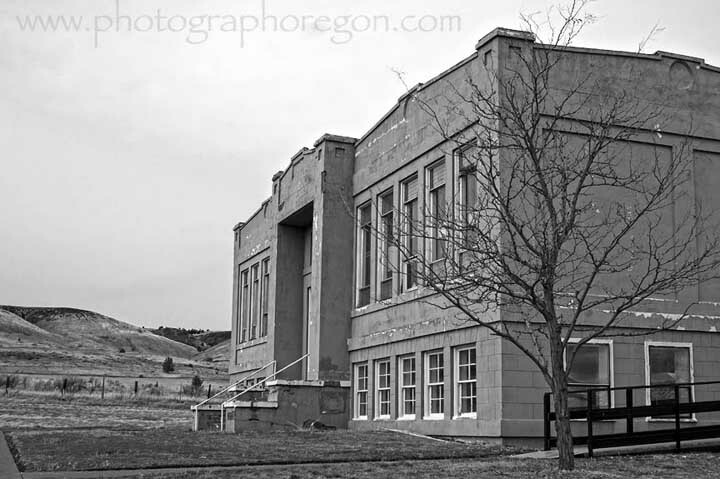 All around us here in Oregon are buildings willing to offer themselves as black and white structure photography models. I’m fond of the older ones but am willing to entertain the fine lines of newer models should I run across something interesting! 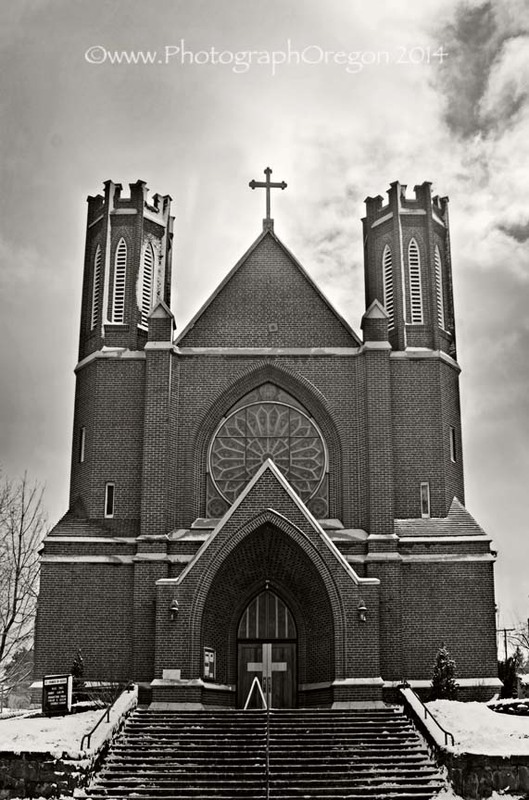 This is the lovely Saint Francis Catholic church on Lava street in downtown Bend, Oregon. It was the temporary home for our church after our Trinity Episcopal Church was burned by arson. I cannot say enough of the kindness of the parish to us. I’m very fond of architecture (especially cathedrals) and I believe that black and white photography helps show the fine bones of structures. 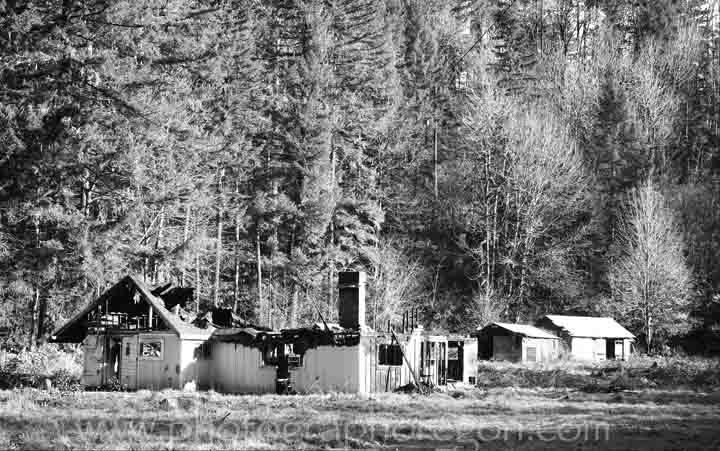 This one I am showing you next, you can’t go photograph anymore, as they tore it down and brought in a manufactured home. I would just like for you to keep in mind the possibilities should you come across a newly torched home (or any other structure). I was driving on the Santiam Pass when I spied this poor thing. The smell of charring was still in the air and the enormity of the tragedy hung like a miasma. I turned around and went back. It was silent. The hills behind were still bright green with some late fall color in them. The grass was gold and green and the house bright turquoise and white, where it wasn’t burned black. 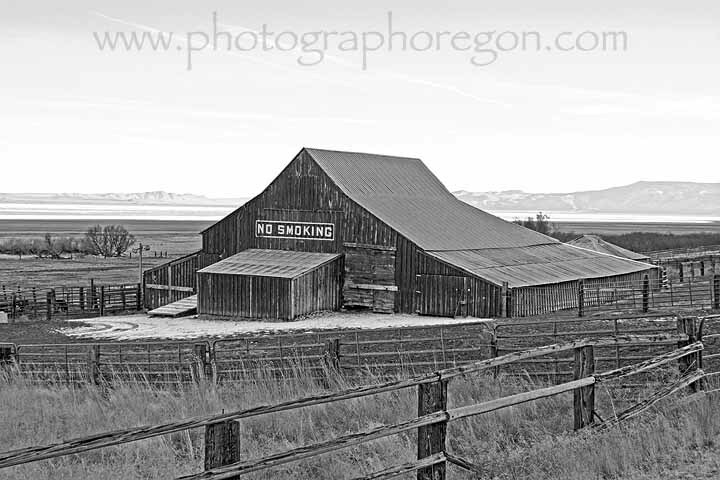 This next baby is your typical barn, maybe with the “NO SMOKING” exception. It’s located in Summer Lake, where on that page you can see it with its blaze of color. I do like the color, but I also like the way black and white makes you focus more on the architecture. The patch of snow on the ground is pretty helpful in setting the barn off well. I would have to say that the “NO SMOKING” also helps to really define it. If you're out on the highway in Summer Lake, you can’t miss it. …and while you’re there in Summer Lake, drive a little further down the road to the old Harris Schoolhouse. This is one of the sepia images I was talking about on the black and white animals page. I like the feel of the sepia for this image setting the time. 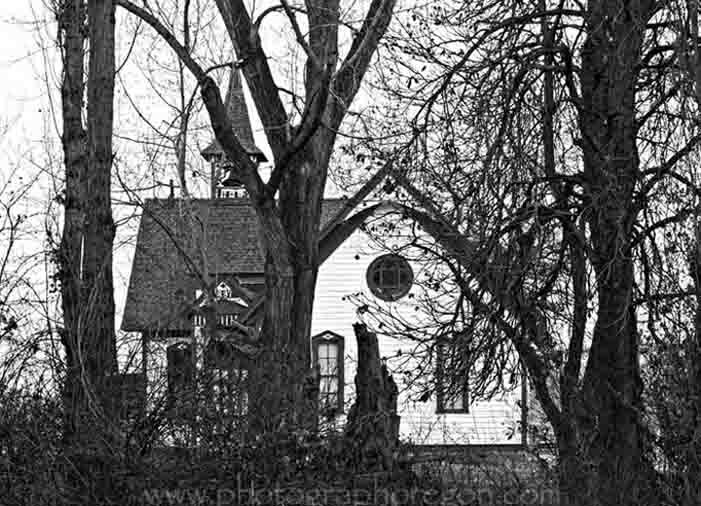 A big white schoolhouse with a patched roof against a brown hillside is perfect for a monochrome image. I’m sure when the wildflowers are out you might have a different idea (and at sunset when I shot the colors reflecting in the windows), but generally in the middle of winter, I’m liking the sepia. When I say “structures” for this, I am hoping to pull you out of the “buildings” box a little and grab a few cool bridges and such. This bridge should be photographed in all seasons. I worked for a year in Eugene, which is 130 miles from my house. I drove in on Monday morning and home on Friday night. This bridge is on the way. It’s an old rail trestle and a lovely one on highway 58 that you drive under. The good news is, it’s also near Salt Creek Falls and Oakridge. This bridge should be photographed in all seasons. I worked for a year in Eugene, which is 130 miles from my house. I drove in on Monday morning and home on Friday night. This bridge is on the way. It’s an old rail trestle and a lovely one on highway 58 that you drive under. The good news is, it’s also near Salt Creek Falls, which is just east of the tunnel. 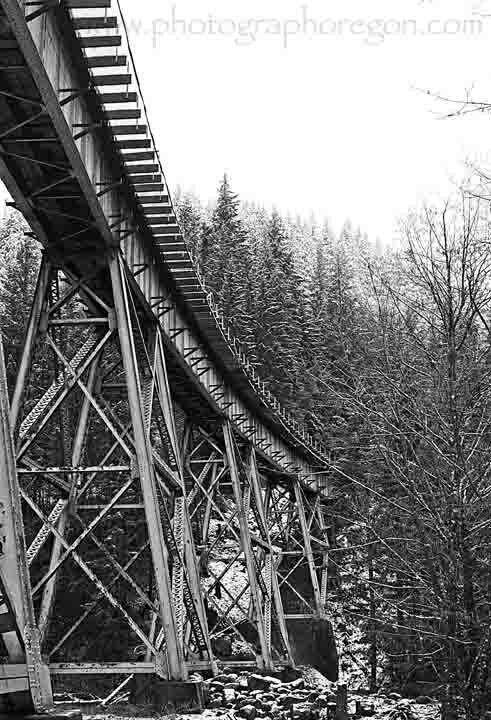 The trestle is 5 miles west of the tunnel and 15 miles east of the town of Oakridge. 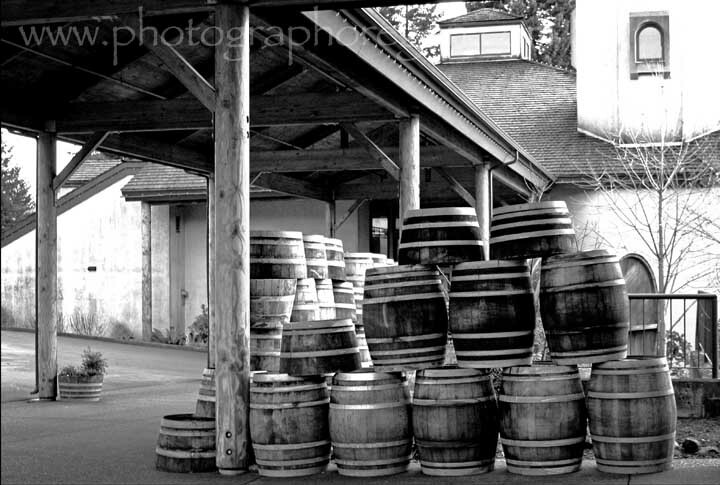 Here we have one of my favorite places in Oregon, Willamette Valley Vineyards Winery . Again, not a building here, okay, kind of back there in the background, but more the barrels and accenting of the walkway and the fantastic light that caught my eye. I can’t explain (and since I get to make this up, I don’t have too :) I just like it. Might be the location! They are the nicest people ever and photographers are welcomed and treated superbly! Wait. Now I suppose I need to tell the story. I was down in the barrel room, all set up to take some bracketed shots of the lovely warehouse of barrels when this tall gentleman in a suite came along and was trying to get out. I should have moved everything but, you know how focused we get…so I made him, sort of…crawl over the tripod and such. He never said a word except “Hi” and smiled nicely. My awesome guide asked me after he was gone if I knew who that was….”Uhhh…no?” Of course it was Jim Bernau, the founder and owner. ***BLUSH*** opps…He’s my hero and I made him crawl over my stuff and didn’t even TALK to him…….so sad for me. One of my next goals is to get the winery page done where I can properly feature his winery. Okay...back to buildings, or in this case abandoned ruins. This is what I think is the old stage stop (I can’t get anyone to verify that…maybe because there is no one left who can…) at Cross Hollow. It’s just a very short (under a mile) distance outside of Shaniko on the road down to Antelope. So, if you’re on a Ghost Town trek, be sure and stop. Again, it’s lovely in color, but the bones show much better without the distraction of the bright colors of that beautiful day. 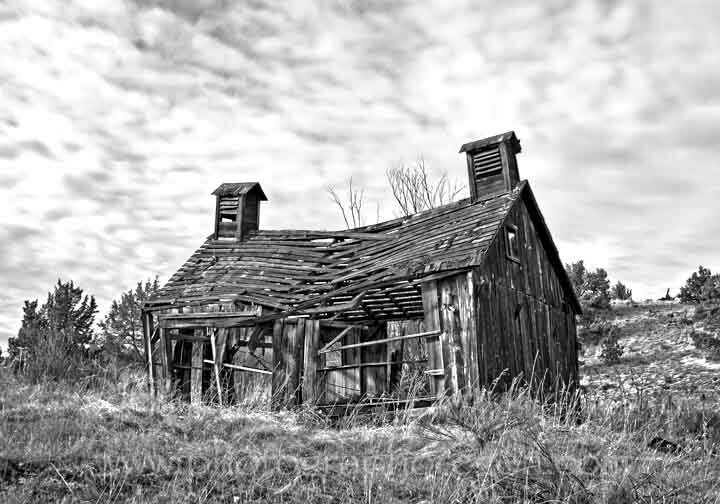 I also wanted to touch a little on black and white HDR photography, as it applies to structures so I can lure you on over to the black and white HDR page. Even in the black and white genre, you gotta love all the stuff you can play with and spend money on now! It used to be paper, chemicals filters and film…Now it’s software, software, software and chips. …oh, and hard drives and filters and…and… and…. This last building is not as old but not too new either. 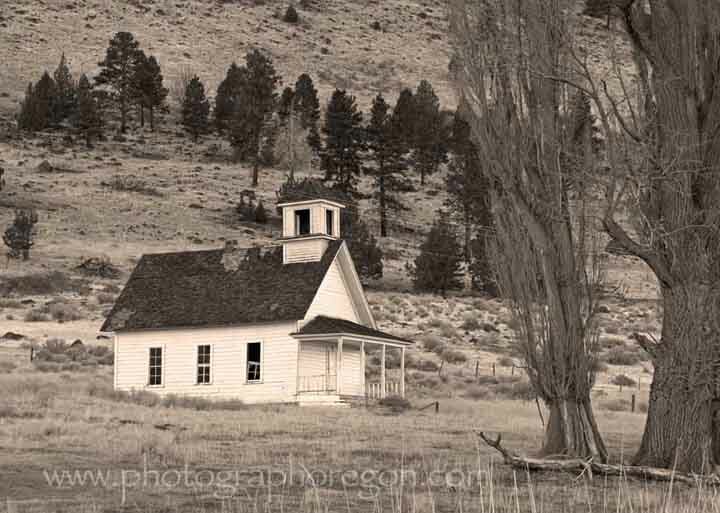 It’s the schoolhouse in the ghost town, of Antelope. I did it in black and white to imply the lack of life. Schoolhouses usually are ringing with the laughter of children. There are no children there now and it is being renovated to house the new town council. So there are some ideas for structures around Oregon that make good monochrome image models and hopefully give you some ideas. As soon as I find a modern building I deem worthy, I’ll add it! I think I might need to check out the new Deschutes Brewery building…..